YOU SUNK MY BATTLESHIP! That's the phrase you'll be hearing when you engage in this entertaining strategic board game for the iPad that is almost a replica of the original game released in 1977. Fun fact #1 for today however... the game was actually invented in the early 1900's by Clifford Von Wickler! But we're talking iPad and Electronic Arts have released some awesome board games of late and Battleship can fortunately be put in this category. Not only does it have some stellar graphics that include cutscenes of ships getting hit by missiles and fighter jets but it offers a variety of new gaming modes to enhance your Battleship experience. 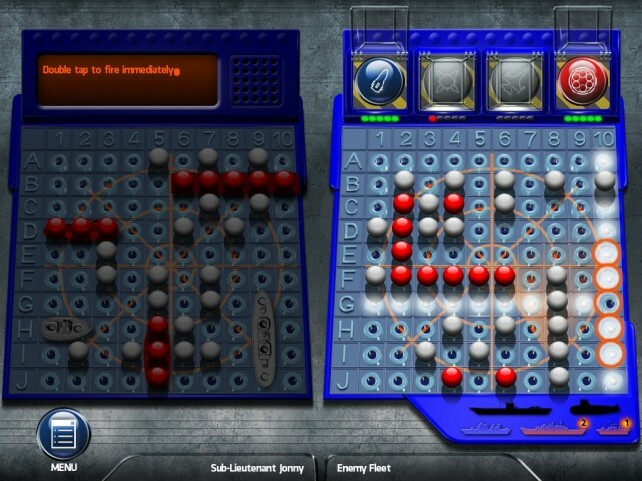 Battleship for iPad also supports 2-players via pass and play or WiFi and Bluetooth. Unfortunately there is no online play via WiFi which is a shame because it would have been a hoot to play this online. If the game had internet multiplayer, it would easily be an 8 out of 10 as opposed to 7.5. Supporting three different gameplay modes that include original "classic" Battleship and two new modes called Salvo and Superweapons, not only did this game bring back childhood memories but it's actually a blast (pun intended) to play. The classic mode requires you to arrange your ships on a grid by 10x10 and your ships range from one to four grid spaces in size. The idea is to position your ships all over the map in order to keep your opponent guessing where your ships are. Each player gets one shell to launch onto your map and if you hit a ship, the grid will turn red. This then allows you to fire more shells in that area, either horizontally or vertically to take out the ship. 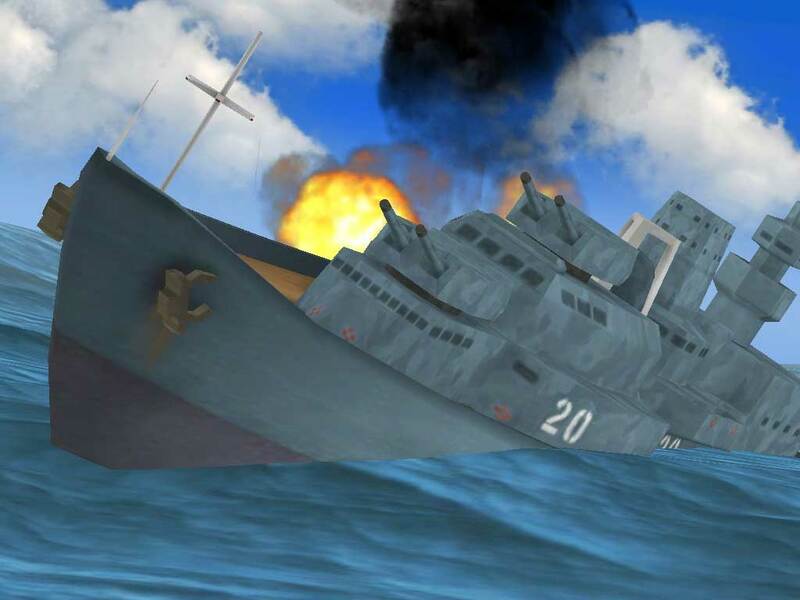 Once you have hit all parts of the ship, you are treated to a rather cool cutscene that shows the ship being sunk. This process continues until one player loses all their ships. It is a numbers game because every hit and miss is marked on the map so lady luck does come into play. The other mode is Salvo that allows you to fire one shot per ship you have. At the start of the game, this means that you have five shots because you have five ships, however if you lose a ship, this then goes to four and three and so on. Salvo is definitely quicker than the classic mode and is a great twist on this franchise. Finally we have Superweapons that allows the player to select a super weapon as opposed to their standard shot. For example you might launch a helicopter which fires five shots into the ocean or launch an airstrike that shoots a line of 3 spaced explosive hits. To keep things fair, each of the weapons have a charge time but nothing is more fun than using one of these weapons to hopefully lay waste to where the enemy ships are located. This mode also contains powerups such as "Shield" to protect a ship or "supernova" that kills any craft it hits but you need to sink 100 ships to unlock this feature. There's definitely lots of incentive here. 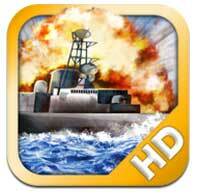 Graphically, Battleship is a good looking game on the iPad, especially the cutscenes that look great such as the jets flying by or ships getting hit and then sinking into the water. If these become too repetitive, they can be skipped by touching the screen or there is an option to disable this function. Sound effects mimic all the sounds that you would expect to hear on the battlefield which does enhance the gameplay. In conclusion, Battleship for the iPad is a fun and addictive game and although it supports an AI mode for single-player, multiplayer is where all the fun happens because it's more entertaining to sink a friend's ship as opposed to the iPad AI itself. The gameplay mimics the original game perfectly and the new modes really enhance the gameplay by throwing a few new twists into the classic gameplay. The only downside to the game is that there is no online play to challenge other people from around Australia or the world which is a shame. Even so, it's still a great game to have and will offer you endless hours of enjoyment and frustration to the losing party.